The Verse’s Harry Carrington shares his guide on how to live a sustainable life on a tight budget here in Brighton. The Guardian published an article in 2013 reporting that 84% of millennials believe it is their generation’s duty to change the world. So it’s no surprise to see so many people trying out a more ethical and cruelty-free lifestyle recently. A lot has changed in this regard over last few months. 2017 ended with the BBC’s Blue Planet II capturing the attention of audiences all over Great Britain. The message about the impact of climate change and human waste, specifically plastics, on marine life was impossible to ignore. It will be years before I will be able to forget David Attenborough’s heartfelt declaration that “the future of all life now depends on us”. The new year was then kick-started with Veganuary, achieving record-breaking sign-ups and making national headlines. This led to a lot of wonderful conversations about veganism and the sustainability of agriculture across the British media. Conversations that would have been ridiculed even 10 years ago are now happening everywhere. Even on the sofa of ITV’s This Morning. It seems that now really is the ideal time to have a crack at a cruelty-free lifestyle. If you’re considering transitioning into a more sustainable lifestyle, there’s no better place to do so than in Brighton. It might appear unaffordable initially, but I have come up with a handy guide on how to go cruelty-free on a student budget. According to the vintage clothing giant Beyond Retro, every year in the UK every household throws away 35kg of clothing. With roughly 1,800 gallons of water going into producing just one pair of jeans, it’s clear why there’s a need to consider pre-loved clothing. Second-hand clothes have recently shaken off the hand-me-downs tag and are becoming more popular year-on-year. Living in Brighton we are lucky to have a wide array of shops to choose from. But be careful, some shops will put on a fancy display and mark the clothing up by £10-£20 more than other stores. Independent Rag is a small thrift store located in the heart of the North Laine. With a charming blue exterior, it’s easy to spot with the £5 rails outside on a sunny day. With clothes suitable for all seasons and regular sales, Independent Rag is always good for finding a gem. To Be Worn Again (TBWA) has one store located on the same street as Independent Rag and another in the North Laine on the charming Kensington Gardens. A much bigger store with a distinct red front; this is very much a shop for those who love clothes shopping. It’s easy to spend hours searching TBWA due to the size and quality of their stock, but best of all you can do so on a student budget. In 2015, it was estimated that eight million metric tons of our plastic waste enter the oceans per year. As a society, we have grown addicted to plastic. Yet recently the visibility of plastic pollution has meant that it has become a massive symbol of the impact of human pollution. Brighton has so many fantastic options for tackling your own plastic addiction, some of which are more budget-friendly than others. What better place to start than at the University of Brighton itself. The university launched its reusable cup scheme with the aim of reducing the number of disposable coffee cups wasted by 125,000 a year. The University has already saved 50,000 since September. As well as cutting waste and carbon, this could be saving you money – every time you use your reusable cup at the university cafes, you get a discount on your drink! Brighton has tonnes of independent greengrocers located all over the city. In my personal experience, you will find local fruit and veg available at these marketplaces in much more ‘student-friendly’ prices. It varies from greengrocer to greengrocer, but many will offer paper bags as opposed to plastic bags too. My personal favourite is located at Unit 12 in the Open Market. It is such good value that since my first shop with them, I’ve remained loyal every week. Refill is an app that tells users which cafes and shops in the near vicinity will refill their water bottle. 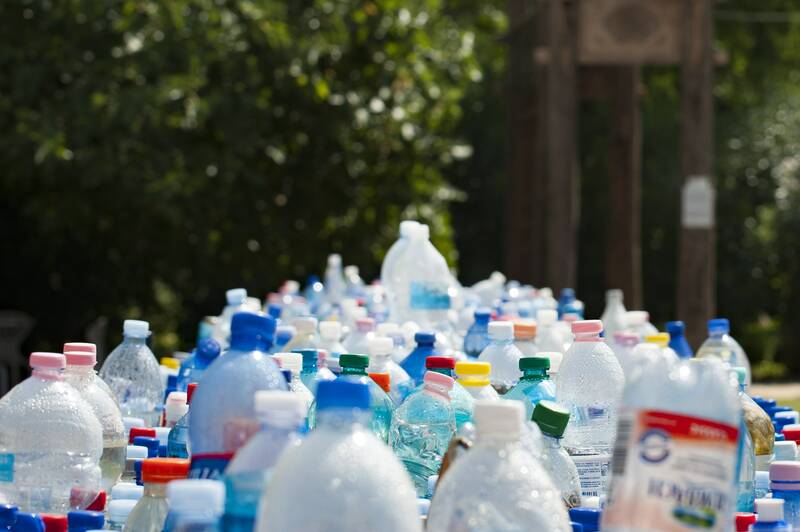 With 132 refill stations in Brighton, there is no reason to continue to buy plastic water bottles. As an independently owned Supermarket located on York Place near London Road, Hisbe stands for How It Should Be; a supermarket that is run in a more sustainable manner for the environment and society. They are the self-proclaimed ‘supermarket rebels’. How it should be can be seen as quite expensive, but a large portion of its revenue is paid to its staff and suppliers. This does, however, mean that a student budget might suffer from frequent trips there. Despite this, no article on living sustainably in Brighton would be complete without mentioning their packaging free range. Simply bring your own containers and you can refill on cupboard essentials like rice and pasta, and eco-friendly household cleaning products. Each year in the UK, we waste 7 million tonnes of food and drink, costing the average household £470 per year. This amount could make a massive difference to a student budget, especially given the costs of living in Brighton. Olio is the food sharing revolution; the app connects neighbours, local shops and communities to tackle food waste. This includes receiving free or heavily reduced items that would otherwise be thrown away. Perhaps not the best tool to seek out a specific ingredient, but really helpful for getting items on the cheap or donating items that you otherwise won’t eat. It’s also worth adding that Brighton also has a range of food banks and homeless shelters that students can donate unwanted food too. Community Composting is a scheme organised by Brighton and Hove council and run by Brighton’s residents. There are numerous schemes across the city, and the council are always open to the idea of introducing more. In fact, they recently doubled the number of compost points in my local scheme to keep up with demand. Composting is an excellent way to reduce household waste, and the scheme can enable students to get more integrated within their local communities. The scheme has been such a success, the university should strongly consider bringing something similar into the halls of residence. The Global Footprint network recently reported that food production makes up 26% of our global footprint. This provides a huge opportunity to reduce our negative impact on the planet. It will come as no surprise to a lot of you that most environmentally friendly and cruelty-free diet is veganism. In fact, a vegan diet will save one animal a day and 10,950 square foot of forest over the course of a year. Veganism is one of the best ways to reduce your carbon footprint, and Brighton offers some of the finest vegan food available. People travel from across the country just to try Terre à Terre and Purezza. However, these venues are slightly on the pricey side. Therefore, I have produced a list of the must tries for all students during their time living in Brighton. Coffee Counter caters to all diets, has a resident dog, Rudy, and produces the best toasties around – the ‘Vegan Reuben’ is the best lunch in Brighton. 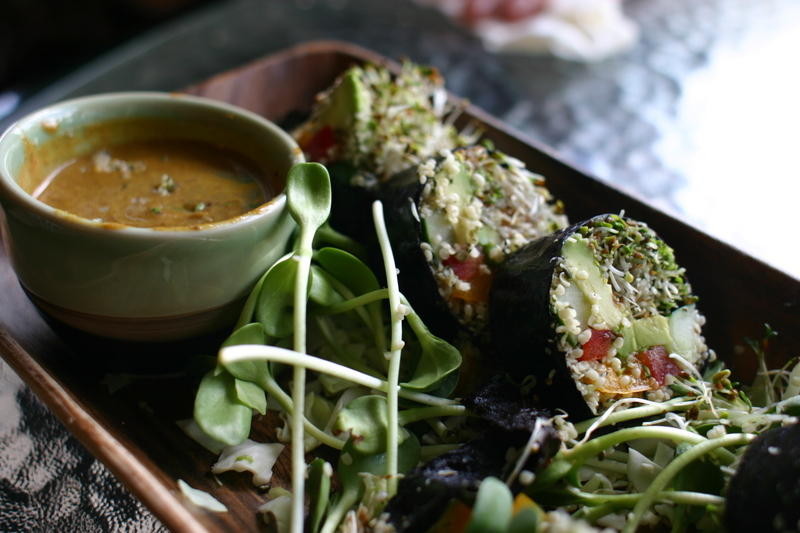 Happy Maki spend their summers touring festivals, where they initially perfected the vegan sushi roll. Now, they’re located a stone’s throw from the beach, and they just can’t be bettered for a cheap, light dinner. The mother of all vegan junk food, Beelzebab is the true answer to the sneer “oh you’re a vegan, what do you even eat?”. Loaded fries and hot dogs, with a special every month. As well as deep-fried bar snacks, all of which can be sampled whilst enjoying Brighton’s amazing music scene. Glazed used to make dairy doughnuts. Then one day they produced vegan doughnuts for an event and they just tasted better. They haven’t looked back since, and now numerous cafes across Brighton stock their delicious doughnuts. Personally, they’re best enjoyed from Glazed themselves, located opposite The Level. When it comes to eco-friendly travel, Brighton really has your back. 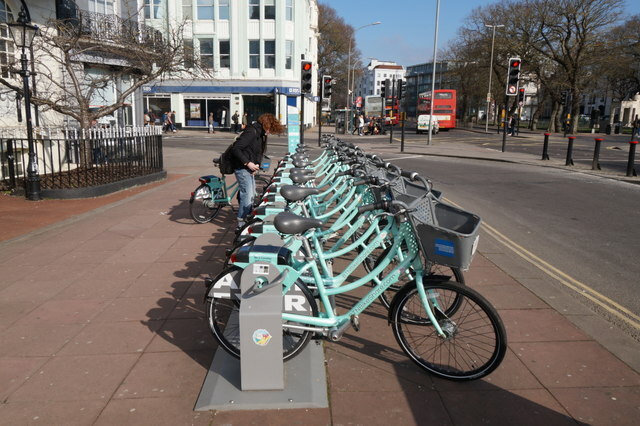 The Brighton bikes are a wonderful way to get around the city, and the buses are also very regular. Making it easy to get about and to go and explore the city and the beautiful South Downs. The extensive range of independent stores, full of locally-made products, mean that looking for ethical and eco-friendly gifts in Brighton is incredibly easy. It is definitely worth taking a look around Eden Perfumes, located on Western Road and the North Laine, for their completely vegan range of men’s and women’s fragrances. In 2011 the UK was being so wasteful that it would have required 2.4 Earths to sustain us, and our consumption has only got worse. It can be expensive to live an eco-friendly lifestyle, but climate change will be far costlier. Changing your diet is a great way to get started. Veganism and vegetarianism can actually be far cheaper than the diet of an omnivore – think about how costly meat and cheese can be! Even if you’re not ready for a big lifestyle change, there are plenty of other opportunities to make a difference in our wonderful city. Why not get out and explore the amazing cruelty-free lifestyle that Brighton has to offer?